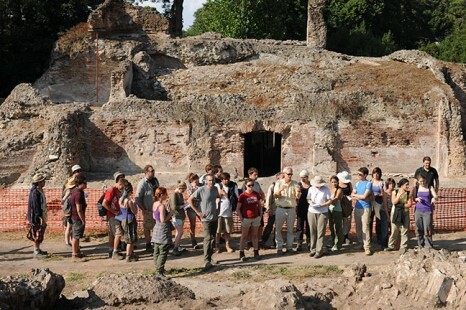 The Portus Field School will run for two weeks in 2018. The Field School begins on Sunday June 17th, with a welcome dinner for all participants, and the last working day is Friday June 29th. The normal working day is from 8:00AM to 6:00PM, with a coffee break and a lunch break. We will work five days a week, with Saturday and Sunday being days off. On Saturday June 23rd a field trip will be organized to Ostia and/or other relevant sites and museums in the area. Before you arrive you will be provided with necessary background information, including a field school handbook with brief introduction to the site, outlining our aims, results and methods, providing further practical information. Furthermore, in February we will run the Portus MOOC again: Archaeology of Portus: Exploring the Lost Harbour of Ancient Rome. Taking part in the MOOC would give you a perfect introduction to the site and the work you can expect to do while there. On your first working day you will be given a half-day introduction to the site and the field techniques you will be using. This will include a Health and Safety briefing, followed by a site tour. You will be assigned to a particular trench and site supervisor on the excavation, who will be on hand to give you constant guidance. During the following weeks you will be given field tuition as you are rotated through different tasks, allowing you the chance to try your hand at all aspects of excavation. At the end of every week all participants will be kept up-to-date with overall site progress by means of a weekly site tour. This training will be supplemented with lectures given by field school staff and visitors. These will provide participants of all levels with an understanding of the wider context in which the work at the site is situated.